KELOWNA, BC--(Marketwired - June 15, 2017) - Anyone going about their daily business in downtown Kelowna yesterday may have witnessed an unexpected sight: a group of brightly-costumed superheroes about town, providing small acts of kindness to Okanagan locals. 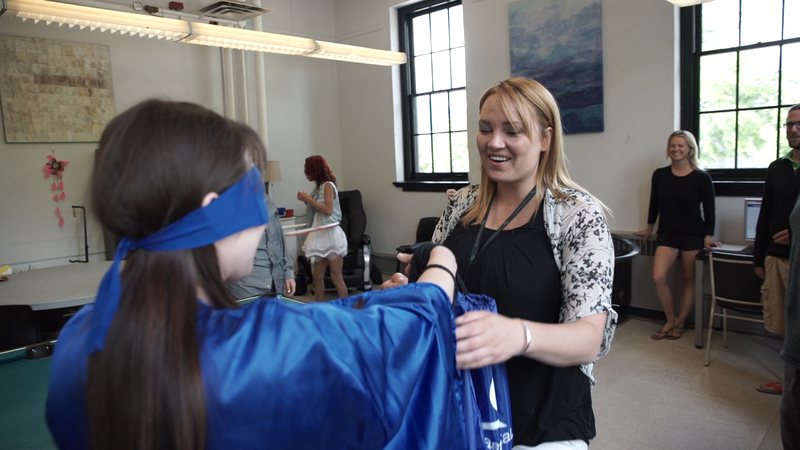 The Help Heroes were sent on a mission by Coast Capital Savings to provide a helping hand to the Kelowna community. From helping shoppers with their groceries in the morning to volunteering their time with the Okanagan Boys & Girls Club in the afternoon, the Help Heroes were spotted all over Kelowna on Wednesday, greeting people with a smile, a high-five, and some good old-fashioned neighbourly help. "Whether we are rolling up our sleeves to assist local community organizations or engaging our members in actions to improve their financial well-being, we're all about help," says Bonnie Kilistoff, Manager Member Services, Coast Capital Savings Kelowna Branch. "Coast Capital's "how can we help you?" philosophy extends to everything that we do, and we want the community to know that we are a great alternative when it comes to financial institutions in Kelowna." Coast Capital joined the community of Kelowna in November 2016 with the opening of their first Okanagan branch at 1544 Harvey Avenue in Kelowna. The branch features a new, reimagined design concept focused on improving members' financial well-being. The new branch moves away from the purely transactional nature of the traditional financial institution to create a space for meaningful helpful interactions -- a place where members can focus on building a healthy financial future. "Coast Capital takes our members' financial well-being very seriously -- ourselves… not so much, and the Help Heroes are a great example of that," explains Lawrie Ferguson, Chief Marketing Officer, Coast Capital Savings. "Coast Capital is here empower Kelowna residents to achieve what's important in their lives. We are excited to be joining the Kelowna business community, and we want to show Kelowna our commitment to helping our members achieve financial success." Coast Capital Savings is Canada's largest credit union by membership. An Imagine Canada Caring Company, the credit union invested $5.6 million into local communities in 2016, focusing on empowering and engaging youth. Coast Capital is one of Canada's 10 Most Admired Corporate Cultures™, and a member of Canada's Best Managed Companies Platinum Club. It has 52 branches serving its 543,000 members in the Metro Vancouver, Fraser Valley, Vancouver Island and Okanagan regions of British Columbia. Product innovations include Canada's first free chequing account from a full-service financial institution. To learn more, visit coastcapitalsavings.com. The Coast Capital Help Heroes deliver donated backpacks full of hygiene supplies to the Okanagan Boys and Girls Club on June 14th. The Help Heroes spent the day performing acts of goodwill in the Kelowna community to celebrate the opening of the Kelowna Coast Capital Savings branch. 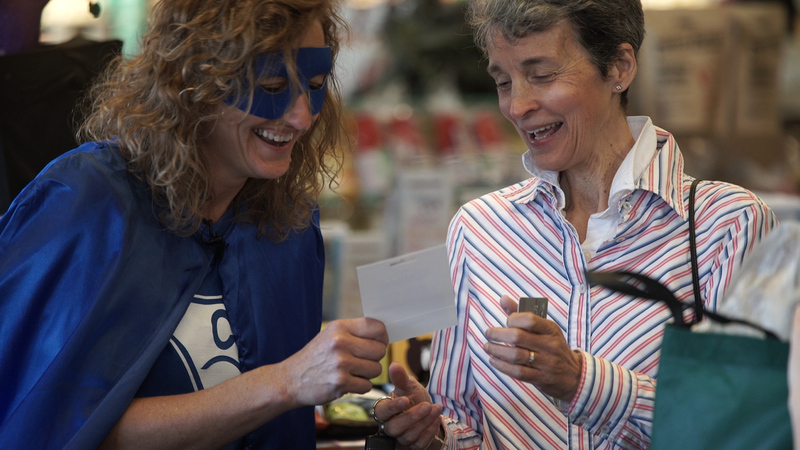 A Coast Capital Help Hero surprises a customer at Choices Market Kelowna with a gift card for her groceries on June 14th. The Help Heroes spent the day performing acts of goodwill in the Kelowna community to celebrate the opening of the Coast Capital Savings Kelowna branch. The Coast Capital Help Heroes, along with the staff of the Kelowna Coast Capital Savings branch, pose with a donation to the local food bank on June 14th. The Help Heroes spent the day performing acts of goodwill in the Kelowna community to celebrate the opening of the branch.